The output of a comparator must switch rapidly between saturation levels and also respond instantly to any change of conditions at its inputs. This implies that the band-width of the op amp comparator must be rather wide; in fact, the wider the band width, the higher is the speed of operation. The speed of operation of the comparator can be increased with positive feedback (Hysteresis). The accuracy of the comparator depends on its voltage gain, common mode rejection ratio (CMRR), input offsets and thermal drifts. High voltage gain requires a smaller difference voltage (hysteresis voltage) to cause the comparator's output voltage to switch between saturation levels. 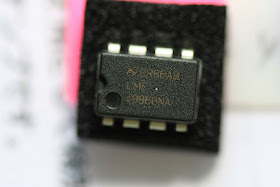 On the other hand, a high CMRR, helps to reject the common mode input voltages, such as noise at the input terminals. Finally, to minimize the offset problems, the input offset current and input offset voltage must be negligible; also, the changes in these offsets due to temperature variations should be very slight. Since the comparator is a form of analog to digital converter, its output must swing between the two logic levels suitable for a certain logic family such as transistor transistor logic (TTL). A general purpose op amp such as 741 can be used in relatively less critical comparator applications in which speed and accuracy are not major factors. As illustrated above, with positive feedback, the switching speed of the op amp comparator can be improved and false transition due to noise can be eliminated. In addition, an offset voltage-compensating network and offset minimizing resistor can be used to minimize offset problems. However, the output voltage swing of an op-amp is relatively large because it is designed primarily as an amplifier. In other words, the output of an op amp comparator is generally not compatible with a particular logic family such as TTL, which requires input voltages of either approximately +5V or 0V. Therefore, to keep the output voltage swing within specific limits, op amps are used with externally wired components such as zeners or diodes. The resulting circuits, in which the output are limited to predetermined values, are called limiters.